The Army is developing a new Long-Range Precision Fires [plural, not singular], or LRPF missile that to replace its current arsenal of tactical missile systems. In 2017 it awarded 36-month contracts to Lockheed Martin and Raytheon for the technology maturation and risk reduction phase 2 to develop a prototype missile. The prototypes will offer an extended range of between 400 and 499 km, with a minimum of two missiles per pod. The "499 km" range is just shy of the 500 km range limit of the INF Treaty. As the next-generation surface-to-surface weapon for the Army, the DeepStrike missile would defeat fixed land targets 60-499 kilometers away. At that ranges, the new missile would be just below the threshold of weapons prohibited under the landmark Intermediate-Range Nuclear Forces Treaty (INF Treaty) that was signed in 1987. 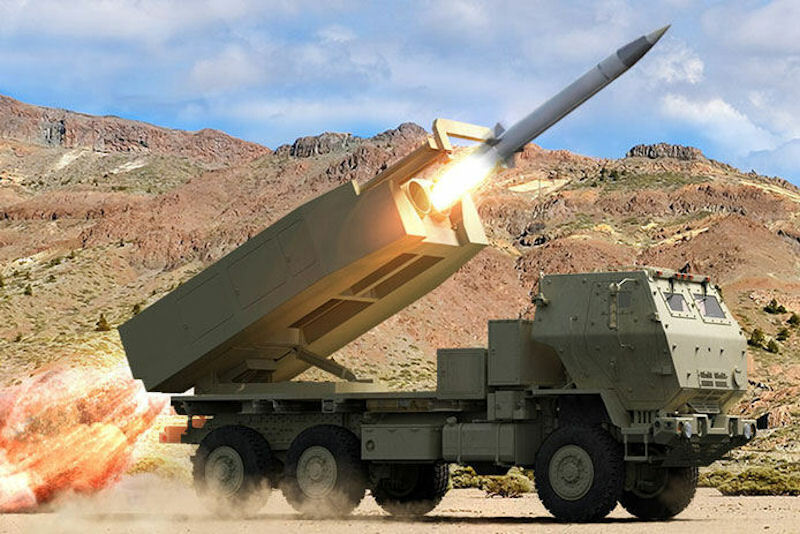 The DeepStrike missile would improve lethality and responsiveness compared to current systems, and restore the Army's capability to overmatch the threat. The current range of operational fires is just 350 km. Having concluded a policy review of the U.S. Government’s approach to the INF Treaty, in December 2017 the Administration announced an integrated strategy to respond to the Russian Federation’s violation. The U.S. Department of Defense commenced INF Treaty-compliant research and development (R&D) by reviewing military concepts and options for conventional, ground-launched, intermediate-range missile systems. Should the Russia Federation’s actions result in the collapse of the Treaty, these efforts would prepare the United States to defend itself and its allies. The United States will not violate its INF Treaty obligations, which allow for R&D activities that fall short of possession, production, and flight-testing of prohibited systems. In addition, the United States is prepared to immediately cease this R&D if the Russian Federation returns to full and verifiable compliance with the Treaty. Raytheon’s DeepStrike® missile is the U.S. Army’s affordable solution that offers double the firepower, greater range and precision accuracy. "Raytheon is responding to the U.S. Army's desire to accelerate its PrSM program," said Dr. Thomas Bussing, Raytheon Advanced Missile Systems vice president. "We are on a fast track to deliver an advanced surface-to-surface missile that exceeds the Army's requirements by doubling the firepower while reducing the cost." Featuring an innovative, two-in-the-pod design and an advanced guidance system, Raytheon's new long-range precision strike missile will fly farther, faster and pack more punch than the current weapon, which is approaching the end of its service life. Raytheon Company completed a significant milestone in the development of its long-range DeepStrike™ missile to meet the U.S. Army's Precision Strike Missile, or PrSM, requirement. The company integrated its new launch pod missile container into the Army's M142 HIMARS and M270 MLRS launchers. The launch pod missile container integration took place at Fort Sill, Oklahoma, in July 2018. During the integration, Raytheon technicians worked side-by-side with soldiers and Marines on operational launchers to ensure proper fit and functionality. ATACMS will get upgrades to strike moving targets on land and at sea, Defense Secretary Ashton Carter announced October 28, 2016. After two years of pressure from Congress, for the first time since the Coastal Artillery Corps was disbanded 66 years ago, the Army was officially back in the business of killing ships. That gives service a new role in countering the Russians in the Baltic and Black Seas or defending allies against China. The project to upgrade the Lockheed-built ATACMS is sponsored by the Strategic Capabilities Office, created by Carter in 2012. On July 5, 2017, military personnel from the ROK and U.S. Armies conducted a combined show of force following a North Korean intercontinental ballistic missile (ICBM) test. Utilizing the ROK Hyunmu-II Missile and the U.S. Army Tactical Missile System (ATACMS), Alliance forces fired into the territorial waters off the East Coast of South Korea, reaffirming the ability of the ROK-U.S. Alliance to emphatically and quickly respond with deep strike capability anywhere, any time, and any place. On 04 August 2004 the U.S. Army Aviation and Missile Command, Redstone Arsenal, AL, announced that it intended to negotiate a sole-source contract W31P4Q-04-R-R095 with Raytheon Company, Missile Systems Division, P.O. Box 11337, Tucson, AZ 85734. The contract will be to procure engineering hardware and software design, fabrication, and test capability to support the development of long-range precision strike missile technology for the Long Range Aviation Missile (LRAM) program. In 2018 the House Committee on Appropriations was encouraged by the Army’s development of a maneuverable long-range precision fire missile that will provide additional capability to the Army munitions inventory. The Committee also understood that topology optimization design tools and additive manufacturing technologies could be integrated into the production of long-range precision fires in order to advance the capability and reduce the cost of these critical missile systems. As such, the Committee encourages the Secretary of the Army to continue development of this technology and to incorporate low-cost, optimized components into operational platforms. On 12 June 2017 the U.S. Army awarded Raytheon Company a $116.4 million contract to enter the technological maturation and risk reduction phase of the Long-Range Precision Fires program. The technological maturation and risk-reduction phase includes testing missile components to be sure the design is ready for engineering and manufacturing development and live-fire demonstrations by the end of 2019. By October 2018 Raytheon was developing a long-range missile for the Army’s Precision Strike Missile requirement that will allow the Army to field twice as many missiles on its existing launch vehicles. Thin and sleek, it will fire two missiles from a single weapons pod, slashing the cost. The new missile also flies farther, packs more punch and has a better guidance system than the current weapon. “We're looking to replace a design originally from the 1980s," said Greg Haynes, a Raytheon manager leading the company’s campaign for a new precision strike weapon. “Missile technology has come a long way.” Raytheon accelerated the development of the DeepStrike® missile, its long-range, precision-strike weapon. In 2018, the company adapted its new launch pod missile container for the Army’s M142 HIMARS and M270 MLRS launchers. The ability to fit two DeepStrike missiles in an existing launcher is a significant leap over existing tactical missiles. “Since most of these were produced in the late '90s, you run into what we call ‘end of shelf life,’ where the motors and such are no longer reliable,” said former Army colonel John Weinzettle, now a program manager in Raytheon’s Advanced Missile Systems business. An upgrade became even more urgent considering how quickly threats are evolving around the world. “Adversaries are already equipped with precision strike weapons that could inflict substantial damage at distances beyond the Army’s striking power,” Weinzettle said. The DeepStrike missile is primarily meant to attack fixed ground locations, like helicopter staging areas or hardened bunkers. Because current missiles have restrictions in size, payload effectiveness and range, a simple life-extension program cannot address long-term threats. Marine infantry veteran Allen Horman, now a business development manager in Raytheon Advanced Missile Systems, explained that life extension doesn’t add any more capability to the existing inventory. “You are still stuck with the larger round and you still have single loadouts,” Horman said. “So the cost to go to a new missile and a new program to double the loadout is significantly cheaper than what people traditionally say about new starts.” Drawing from experience in missile defense and precision weapons, Raytheon has developed a missile that is capable and cost-effective. “One system can fire twice as many missiles, twice as fast, and it’s much cheaper because it uses one launcher with two missiles,” Horman said.